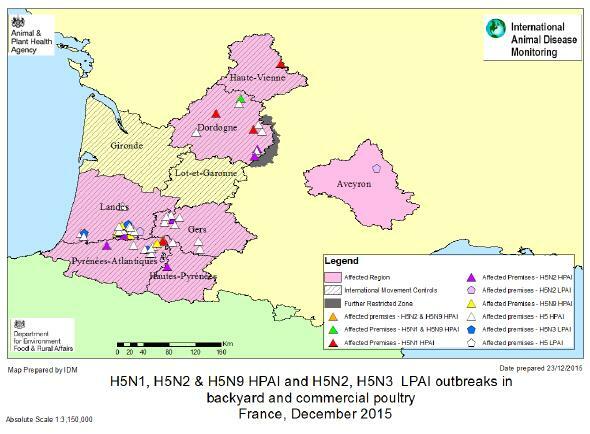 The UK's DEFRA (Department for Environment, Food & Rural Affairs) has released their 4th update and analysis of the ongoing HPAI outbreak in Southern France. You'll find their previous reports here, here, and here. With French official statements being long on reassurance - but short on specifics - these DEFRA reports have become our best source of information on these outbreaks. In this morning's report the authors (Professor Ian Brown & Dr Helen Roberts) try to make sense of a very complex and unusual outbreak - one that involves at least 5 new strains of avian influenza - and once again cite the lack of full genetic sequence data as hampering their ability to render a full assessment. . . . . the full gene sequences for a multiple number of viruses will need to be determined and analysed before clear conclusions on pathways of origin, length of time the virus has been evolving in the field and implications for zoonotic risk can be concluded, as they may still be re-assortments or genetic adaptation occurring. Infection with any AI virus in particular circumstances of high exposure (such as those operatives in the field who are involved in control measures) cannot be ruled out. A stance, I might add, that closely aligns with our own CDC's analysis of the threat from HPAI H5 in this country (see CDC Clinician Guidance: Evaluating Patients Exposed to HPAI H5 Avian Flu). The authors also discuss a couple of possible origins of these emergent viruses, but are once again hampered by a lack of data. The fact that more than a month into this outbreak the international scientific community is still largely in the dark about the origins, lineage, and zoonotic potential of these viruses is both frustrating and difficult to justify. 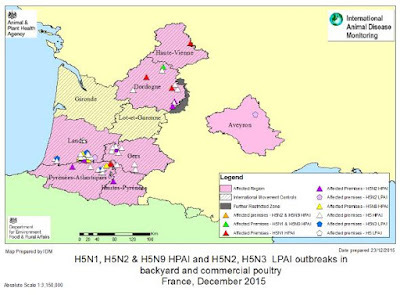 Since the last update on the 16th December, more outbreaks in poultry have been reported as a result of increased surveillance in South West France (Ministère de l’Agriculture, France, 2015; see map – not all outbreaks visible at this scale). To date there are 61 outbreaks of HPAI H5 (N1, N2 and N9), 54 of which have been reported to the EU Animal Disease Notification System. Six regions are affected – Dordogne (12 outbreaks); Landes (27 outbreaks); Haute Vienne (1); Gers (9); Pyrenees Atlantique (10) and; Haute Pyrenees (2). ANSES, the French risk assessment agency, has published an assessment of the likely source of infection, limited partial virus gene sequence data, risk to public health and relevance of restriction measures (ANSES, 2015). The source considered most likely is that LPAI European origin avian influenza viruses were circulating in poultry and have mutated to HPAI then silent spread has occurred in species which show few clinical signs (Anseriforme poultry) or which have been partially immunised by exposure to related LPAI viruses. This theory is given greater confidence by the knowledge that these LPAI viruses are often detected year in year in this area through the EU poultry survey. The preliminary sequence data suggest there is a common H5 sequence to the LP/HPAI viruses. A less likely theory is that multiple LPAI viruses were circulating recently in wild birds and then, after contact with the poultry, these viruses mutated. It is considered very unlikely that the HPAI viruses were circulating in wild birds as there have been no reports of such in EU-wide surveys. On the restriction measures, there is still some uncertainty around how the viruses are spread from one location to another given the significant increase in recent days of new infected premises, hence the large zone now in place. On the public health risk, it is noted that only ‘Eurasian’ strains of H5N1 HPAI have caused human disease (and derived from a different gene lineage to the viruses involved in the current outbreaks), and even so only for people in very close contact with poultry (during home slaughter for example) and no cases have been associated with H5N2 or H5N9 HPAI infection in poultry. See also ECDC (2015). Nevertheless, the full gene sequences for a multiple number of viruses will need to be determined and analysed before clear conclusions on pathways of origin, length of time the virus has been evolving in the field and implications for zoonotic risk can be concluded, as they may still be re-assortments or genetic adaptation occurring. Based on limited sequencing for just three viruses, the authors concluded there are a number of previously identified mutations which may promote the replication of the virus in the mammalian respiratory tract but the combination of all these mutations in affecting host range is complex. Infection with any AI virus in particular circumstances of high exposure (such as those operatives in the field who are involved in control measures) cannot be ruled out. It should be noted that understanding how widely LPAI viruses are circulating in poultry is important as this could present a substantially immune population and needs to be considered in control decisions and surveillance design. It would be helpful to understand more about the way the “feeding” duck and geese industry in France is managed and whether this contributes to the spread. The method for raising birds for the fois gras production for example is intensive and would involve handling the birds frequently, which may increase the likelihood of transmission with shared equipment or poultry handlers. From a trade perspective, we would like to highlight that the new EU Implementing Decision allows a derogation for movement of hatching eggs and day old chicks from the large restriction zone only under written agreement between competent authorities on a case by case basis. The publication of the ANSES risk assessment and the new restriction measures are welcome. The risk to the UK as a result of these outbreaks is primarily around pathways which involve lapses in biosecurity or trade routes, rather than through wild birds as these are apparently wholly European origin viruses. However the situation in France simply reinforces what we already knew, that these LPAI viruses circulate in wild birds and cause occasional spill-over outbreaks in poultry may be difficult to detect in domestic waterfowl species and which may then mutate into HPAI viruses following infection of galliforme hosts. The risk level for the UK remains at low, but heightened. Thank you for your informative and constant blog, and indeed your hard work. for a layman like me it is a window into a very complicated realm. Wishing you and yours a Merry Christmas and a Happy New Year. but how would the HP cleavage site have gone into H5N9,H5N2, and H5N1 ? and then there are multiple introductions into poultry.